what kind of braces did you use? How much would this sell for? - I'd like to buy one. I like it. How are the sides reinforced? They look like they would be fragile with no cross supports. There are four steel angles (one at each corner) to reinforce the sides. Where can I get that rug!? 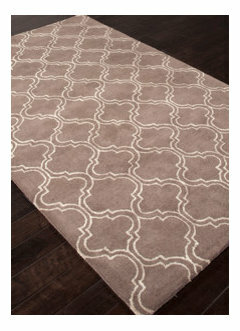 The rug is from pottery barn. Wow! - Any more photos of this house? Love it! yes - under my photos I have some images from the home. Its under 'first house' I am currently designing and building our second home! My brother is in the midst of restoring a 1947 California cottage. As he is the lawyer in the family and I am the interior designer, three guesses who's ending up with the wonderful — if somewhat ratty — old windows and doors. As I ponder where and how to use these pieces in my tiny bungalow, I am inspired by this coffee table. What a wonderful way to use such treasures. Keeping the doorknob as part of the design adds a terrific touch of whimsy. 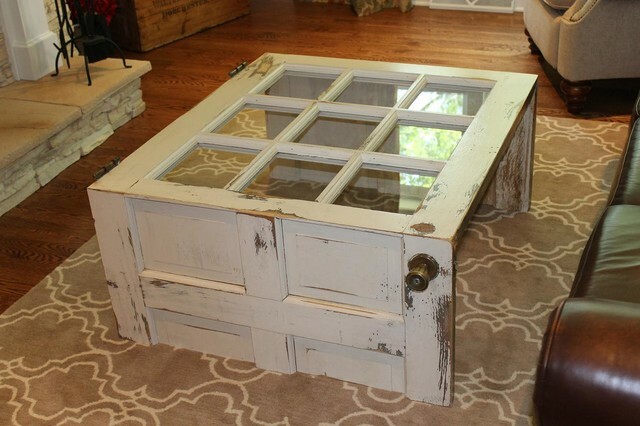 If you have an old door and windows, this creation shows what you can do. Tip: Make sure to stabilize the table by reinforcing the joints on the underside.